*Whew* This writing thing can be tough sometimes. A mug of hot chocolate always helps though. I’ll just take another sip . . . Wait, why is my lip stuck? I tug on the mug to no avail. Then the hot chocolate began to slurp me. The slurper has become the slurped? Confusion from having my lip being sucked in turned into horror as my head was thrust into the mug. Nothing in my body felt broken though as far as I could tell. Was I being shrunk somehow as well? The next thing I knew I was trapped inside of the hot chocolate itself. Upon realizing this I hear my girlfriend coming back from work. I yelled and screamed as much as possible but all I heard was a disappointed “Why did he leave half a mug of hot chocolate sitting around?” as she dumped it into the sink. Moving through the drainage, the hot chocolate held together quite well. It held me together the whole time. No. That’s not it. I was fusing with the hot chocolate. I had become one with the corn syrup, the corn syrup had become one with me. Surviving the waste treatment facility I (We?) had made it to the harbour. My high internal heat had caused me to evaporate at an alarming rate. I was only held in a cloud for mere hours before pouring down onto an office building in downtown Halifax. Despite all of this I already knew what I had to do next. After all, it’s not ever day that you get to torment yourself in the third person. 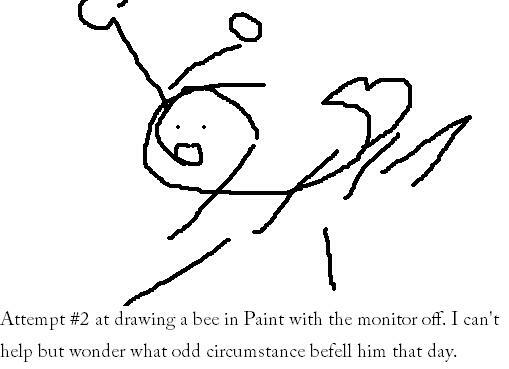 This entry was posted in Bees!, Blog, Blogging and tagged 2012, Art, blind, blog, blogging, paint, pic, pictures, short story, writing, wtf. Bookmark the permalink.